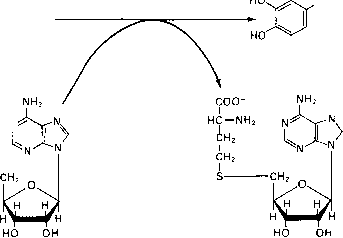 S-adenosyl homocysteine binding to different receptors located on the same or different cell membrane, called a- and ^-adrenergic receptors. a-Receptors act by altering the pattern of ion flow into the cell, particularly with regard to Ca2+, whereas the /3-receptor operates by the stimulation of adenylate cyclase and the intracellular level of cyclic AMP. The two receptor types are somewhat difficult to distinguish because usually either one can bind the same ligand (e.g., epinephrine). Many of the receptors have subclasses wherein each class may operate through a different mechanism. This is true for the a-receptors. Two principal classes are «,-and a2-receptors. a^-Receptors control Ca2+ ion flux, whereas a2-receptors inhibit adenylate cyclase, «-and /3-receptors can be resolved by a specific order of affinity for different compounds and especially by the use of specific inhibitors of each receptor type. «-Adrenergic receptors bind ligands (agonists) in the following order (starting with highest affinity), epinephrine > norepinephrine > phenylephrine > isoproterenol, whereas the order of agonist binding for /^-adrenergic receptors is isoproterenol > epinephrine > norepinephrine > phenylephrine. The structures of these agonists are shown in Figure 11-2. 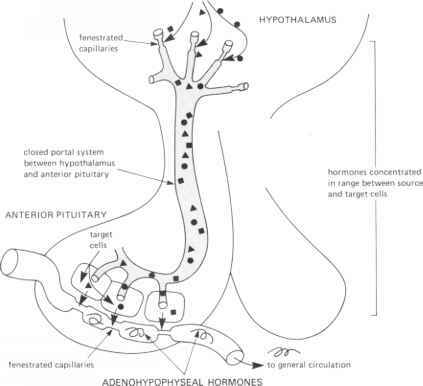 Thus, epinephrine can bind to both receptors, and the actual physiological effect achieved may be a direct consequence of the available amount of catecholamine in a particular location since the binding constants for the various types of the adrenergic receptors may be quite different. Table 11-4 lists the adrenergic receptor types with agonist preferences and antagonists. Activates both nicotinic and muscarinic receptors to trigger catecholamine secretion in rat adrenal medulla." IL-la elevates VIP TNFa* (Ref. A (Eskay, R. L„ and Eiden, L. E., ILla and TNFa differentially regulate enkephalin, vasoactive intestinal polypeptide, neurotensin and substance P biosynthesis in chromaffin cells. Endocrinol. 130, 2252-2258, 1992). (e.g., oxotreniorine-M) promote CA secretion. Apparently both types of agonists bind at 2 different sites on the same receptor which is coupled to secretion representing an unusual cholinergic receptor that has both nicotine and muscarinic features. °'b Chowdhury, P. S., Guo, X., Wakade, T. D., Przywara, D. A., and Wakade, A. R. (1994). Exocytosis from a single rat chromaffin cell by cholinergic and peptidergic neurotransmitters. Neuroscience 59, 1-5.
c Trifaro, J. M., Vitale, M. L., and Rodriguez Del Castello, A. (1993). Scinderin and chromaffin cell actin network dynamics during neurotransmitter release. J. Physiol. (Paris) 87, 89-106.
d Gonzalez-Garcia, C., Cena, V., Keiser, H. R., and Rojas, E. (1993). Catecholamine secretion induced by tetraethylammonium from cultured bovine adrenal chromaffin cells. Biochim. Biophys. Acta 1177, 99-105.
e Isobe, K., Nakai, T., and Takura, Y. (1993). Ca2+-dependent stimulatory effect of pituitary adenylate cyclase-activating polypeptide on catecholamine secretion from cultured porcine adrenal medullary chromaffin cells. Endocrinology 132, 1757-1765. ^Choi, A. Y., Cahill, A. L., Perry, B. D., and Perlman, R. L. (1993). Histamine evokes greater increases in PI metabolism and CA secretion in EP-containing than in NEP-containing chromaffin cells. /. Neuro. Chem. 61, 541-549. 8 Eskay, R. L., and Eiden, L. E., (1992). IL-la: and TNFa differentially regulate enkephalin, vasoactive intestinal polypeptide, neurotensin and substance P biosynthesis in chromaffin cells. Endocrinology 130, 2252-2258.
h Cherdchu, C., and Hexum, T. D. (1991). Differential secretion of enkephalin like peptides from bovine adrenal chromaffin cells. Neuropeptides 19, 237-242. 1 Shirvan, M. H., Pollard, H. B., and Heldman, E. (1991). Mixed nicotinic and muscarinic features of cholinergic receptor coupled to secretion in bovine chromaffin cells. Proc. Natl. Acad. Sci. USA 88, 4860-4864.
! Hexum, T. D., Zheng, J., and Zhu, Ir. (1994). Neuropeptide Y inhibition of nicotinic receptor-mediated chromaffin cell secretion. /. Pharm. Exp. Therap. 271, 61-66.
k Torres, M., Ceballos, G., and Rubio, R. (1994). Possible role of nitric oxide in catecholamine secretion by chromaffin cells in the presence and absence of cultured endothelial cells. J. Neurochem. 63, 988-996. 1 Galindo, E., Zwiller, J., Bader, M. F., and Aumis, D. (1992). Chromostatin inhibits catecholamine secretion in adrenal chromaffin cells by activating a protein phosphatase. Proc. Natl. Acad. Sci. USA 89, 7398-7402.
m Houchi, H., Azuma, M., Oka, M., and Moritaki, A. (1991). Jpn J. Pharmacol. 57, 553-558.